It was a long, cold, snowy commute on the Massachusetts Turnpike and for commuters getting off the train in Newtonville on Tuesday afternoon. 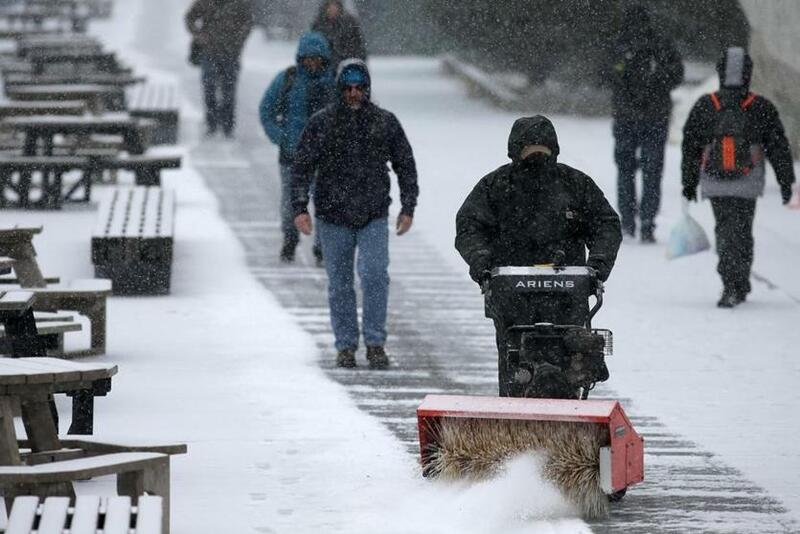 The winter storm that swept through Massachusetts Tuesday arrived just in time for the evening commute, making for a long, messy ride home, particularly in Greater Boston. 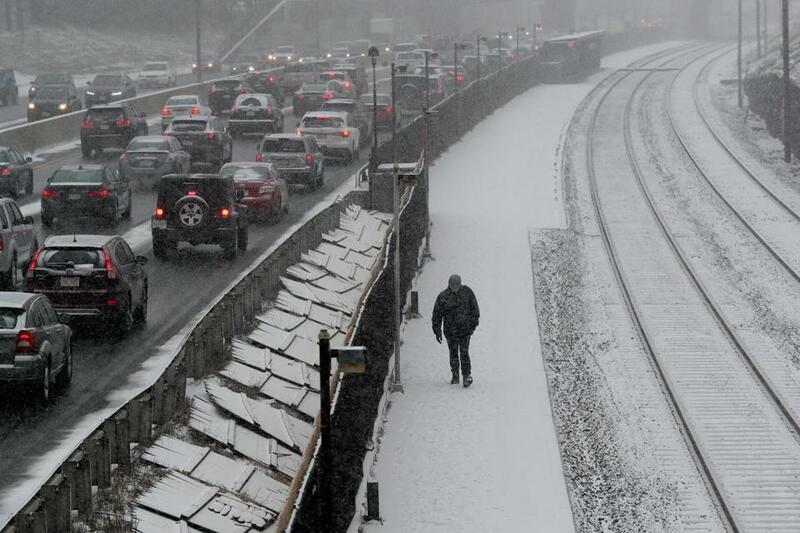 Delays on the commuter rail complicated the journey home for thousands of people, while car crashes were reported on slick roads in Boston, Bridgewater, Brookline, Dedham, and Falmouth, among other communities, police said. State troopers responded to numerous minor crashes and spin-outs across the state, most of them in Western Massachusetts, said David Procopio, a spokesman. No serious injuries had been reported, Procopio said. The storm did not drop massive amounts of snow, according to the totals reported by the National Weather Service. Dolores Callahan waited for her bus on State Street during Tuesday’s snowstorm. Logan International Airport reported 2.2 inches, the weather service said shortly before 10 p.m. Snow and sleet accumulations of 1 to 4 inches were anticipated in southern New England during the storm, according to the service. 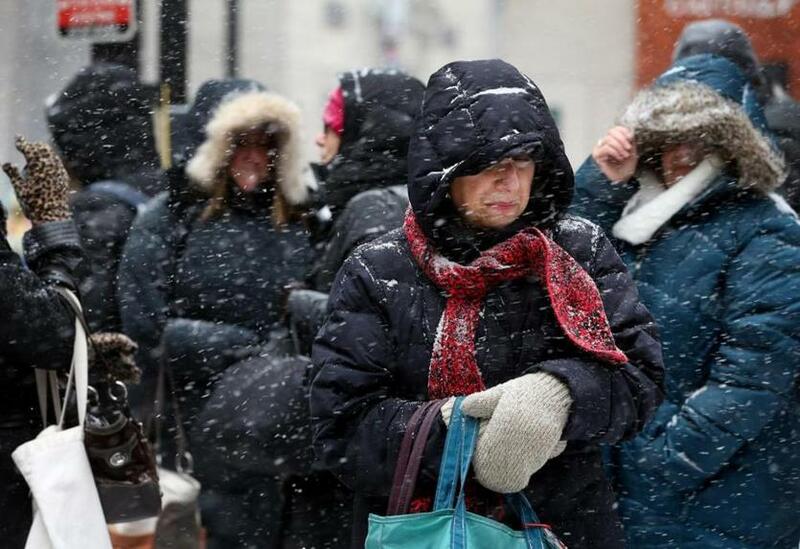 The storm was expected to end by 1 a.m. Wednesday in Greater Boston and northern Rhode Island, the service said. Conditions for the Wednesday morning commute were expected to be considerably better. Temperatures were forecast to climb above freezing. and rain was expected to persist overnight. Bill Simpson, a National Weather Service meteorologist, said the rain was likely to stop at about 7 or 8 a.m.
“It shouldn’t be too bad,” he said of Wednesday morning’s commute. Conditions were far different for much of Tuesday. The going was slow on major Massachusetts highways at the height of the storm, with State Police reducing the speed on a large section of the Massachusetts Turnpike to 40 miles per hour at one point. 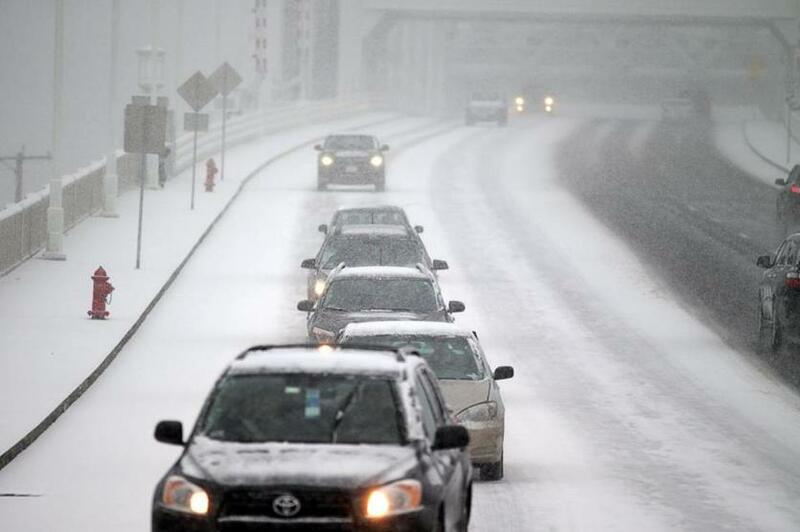 Drivers crossed the Fore River Bridge in Quincy as the snow started. Shortly after 7 p.m., a tractor-trailer jack-knifed on Interstate 495 southbound, blocking all lanes of traffic. There were no injuries and all lanes were reopened in about a half-hour, State Police reported on Twitter. By mid-evening, more than 3,000 crews were clearing state roadways, according to the Massachusetts Department of Transportation. The Massachusetts Bay Transportation Authority’s commuter trains experienced delays as the storm moved into the eastern part of the state during the afternoon. The Greenbush, Kingston/Plymouth, and Middleborough lines reported delays, as the MBTA warned riders that a disabled train near Quincy Center hampered the commute home. Mechanical issues also caused one Middleborough train to run at least 90 minutes behind schedule Tuesday afternoon, according to the MBTA. A 3:30 p.m. train headed to Worcester was operating about 50 minutes behind schedule between Worcester and Ashland because of a switch problem, the MBTA reported. An outbound Framingham train that was scheduled to depart shortly before 6 p.m. was also delayed. 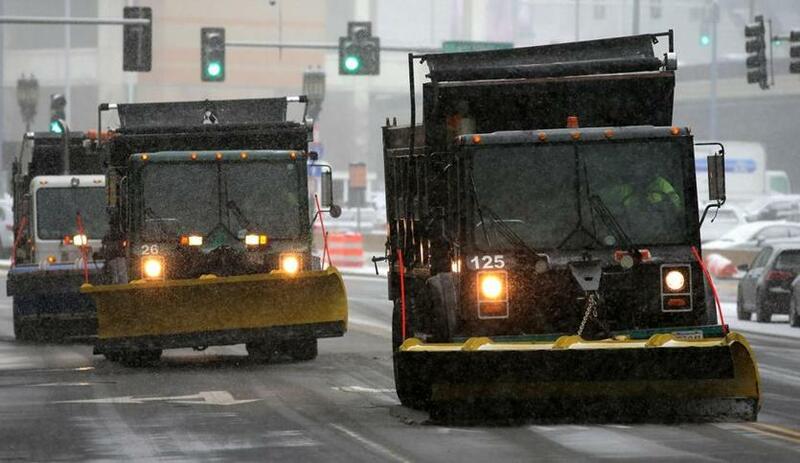 Plows lined up on Congress Street in swirling snow as the storm began. Trains on the Rockport and Newburyport lines reported delays of up to 20 minutes. More minor delays riddled the Franklin and Providence/Stoughton lines. A Fairmount inbound train and a Worcester inbound train were canceled Tuesday night because of “mechanical issues creating an equipment shortage,” the T said. On the subway system, the MBTA tweeted shortly after 4:20 p.m. that the Green Line’s B branch was experiencing small delays because of a minor crash near Boston University Central. An MBTA spokeswoman said a box truck made contact with a Green Line trolley as the trolley traveled from Boston University West to Boston University Central. The trolley’s operator suffered a minor injury. Shortly after 7 p.m., a vehicle got stuck on trolley tracks between the Northeastern University and Brigham Circle stops, preventing trolleys on the Green Line’s E Branch from going beyond Northeastern University. The T encouraged riders to use bus service to and from Heath Street. A worker cleared the walkway in front of the Children’s Museum. Travis Andersen of the Globe staff and correspondents Sabrina Schnur and Breanne Kovatch contributed.